Comments: Flounce of Chantilly, no ombre. Good Romantic floral design with extensive honeycomb fillings. No esprits in the upper ground. Finish: Some light vertical creasing. 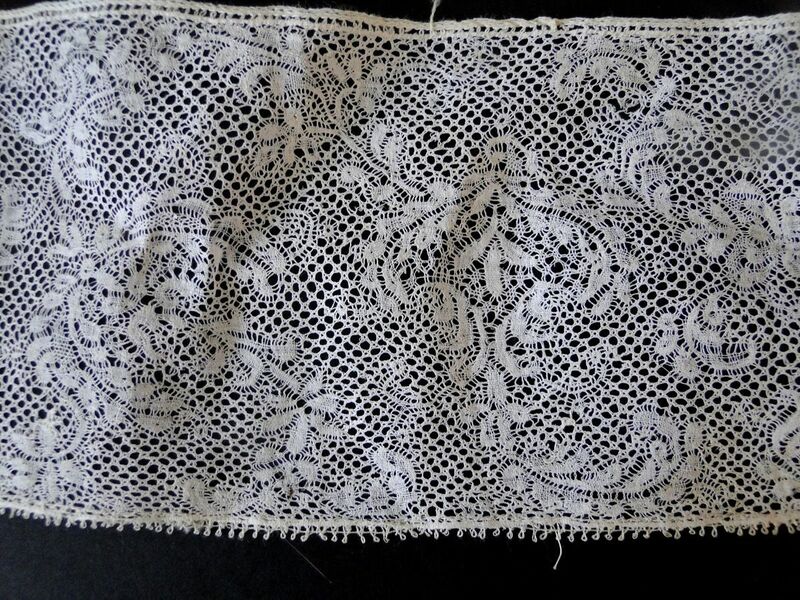 Comments: A flat-grounded ~3rd quarter 18th c needlelace – looks like Burano from the general feel of the design, and the fillings are fairly simple. No overcast raised edges, typical of Burano, but the mesh is a little unusual. It runs parallel to the border, not horizontal as other contemporary pieces. Damage: Pinholes in the mesh, some early repairs to the ground. Finish: No obvious creases, maybe a little light wrinkling. Sold for $62.00, 3 bidders. Comments: An Alençon border, late 18th c.
Modifications: Can’t see the ends to tell if they are cut. Engrelure added. 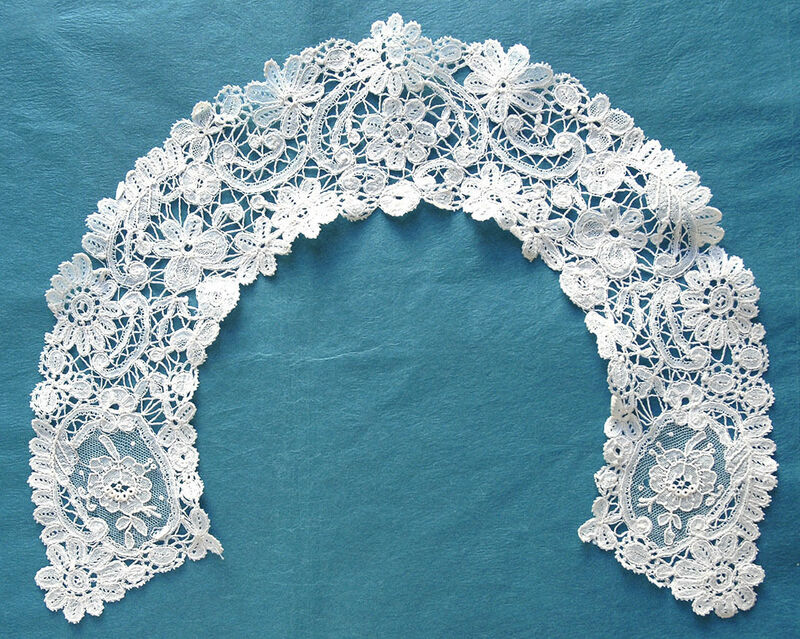 Alençon grounds can be complicated, sometimes the brides tortillée actually includes a buttonhole stitch or two, but not enough to qualify as brides bouclée. This might be the case in this piece where the upper mesh looks a little heavier than the usual brides tortillée. The rest of the design is quite simple, only some picoted rings, and the usual réseau fin along the foot edge – typical of Herren Alençon. Damage: Seller cites some scattered minor repairs. Some fraying in the mesh. 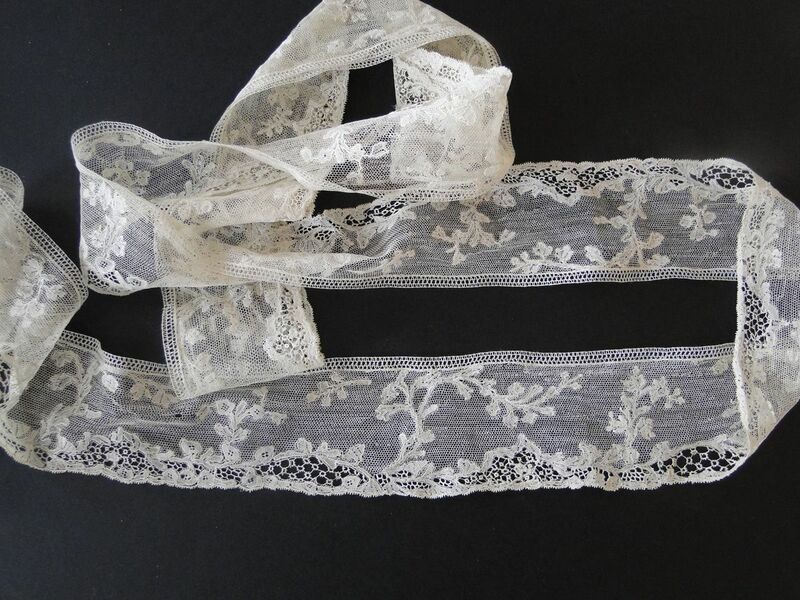 Comments: The lace industry in 18th c Binche was small compared to Valenciennes, and not well documented. This light feathery pattern has been ascribed to Binche, but you usually see it with a snowflake ground. This piece has the cinq trou, although ground experimentation went in many areas in the early 18th c. Until more definitive evidence can be found, it’s good enough to refer to this as a “Binche style”. Modifications: Cut both ends. Unsure about the picot edge, there’s some hand-stitching that might indicate it’s a later addition, although parts look intact. The foot edge engrelure is an addition. Hard to tell if the entire width has survived intact. Damage: ONe stray thread at upper left, but I don’t think it’s important. Finish: No obvious creases, some light wrinkles. sold for 38.00 GBP, 2 bidders. 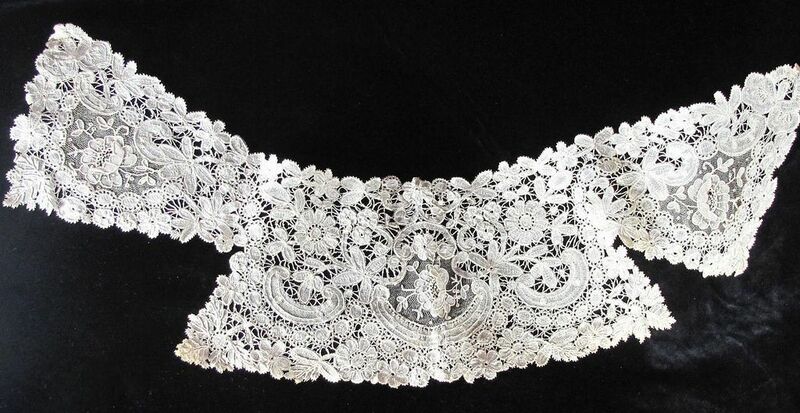 Comments: A small Duchesse de Bruxelles collar. No raised work in the Point de Gaze inserts, and no decorative needle-made fillings. Conventional Duchesse motifs. It all works well for a small collar. Damage: A few pinholes in the PtdG mesh. Finish: No obvious cresases or wrinkles. Sold for 23.70 GBP, 4 bidders. 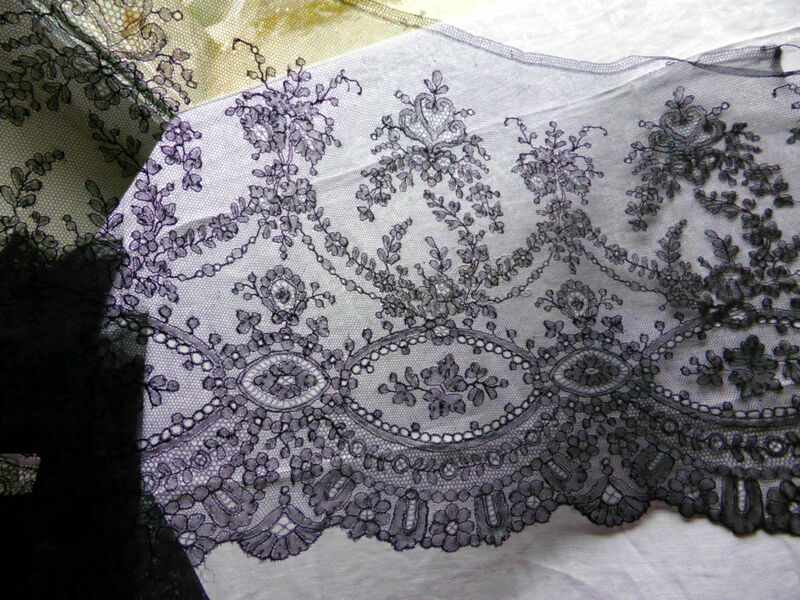 Comments: Triangular Chantilly shawl with an elaborate floral design. Note the large sections of thin, drooping leaves, this is mirrored at the ends. Wide strapwork though out. Quite an unusual design, perhaps later 19th c since it is so different from the typical romantic 2nd Empire florals. The slightly grey appearance probably indicates the finer thread used in French manufacture. Damage: Seller cites about 10 small breaks in the mesh, one large hole near one end. Borders frayed in places. Finish: Folds and crease throughout. Sold for 56.00 GBP, 6 bidders. 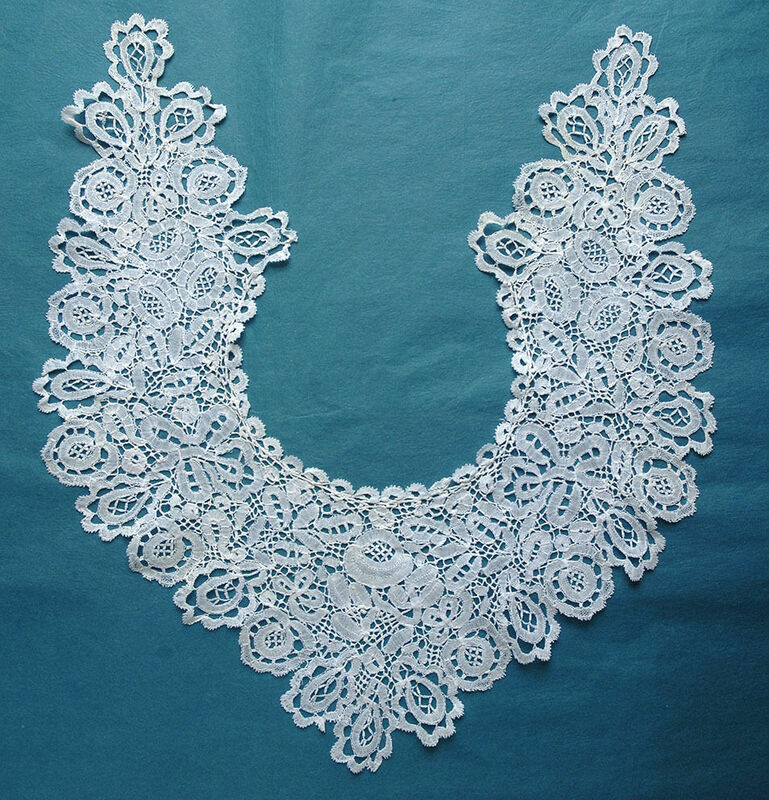 Comments: A Carrickmacross applique collar. 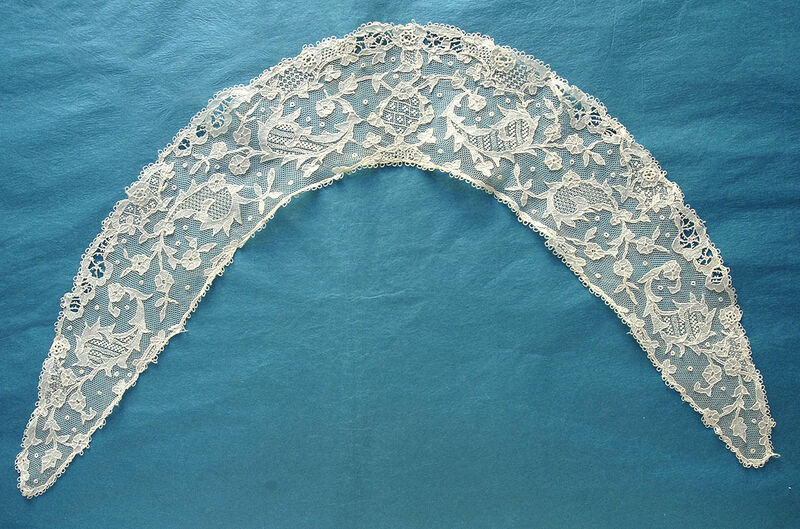 A little cutwork along the outside edge, and note the looped picot on all outside edges. Good needlerun fillings, and a little buttonhole embroidery relief. Damage: A little fraying on some motifs, especially the outer edge – minor. Finish: No obvious creases or wrinkles (except maybe the right point). Comments: A square-mesh Valenciennes narrow border, although sometimes you see this kind of pattern in a round hole mesh. Date uncertain, it has the light early 19th c look, but I suspect it was made though out the century. 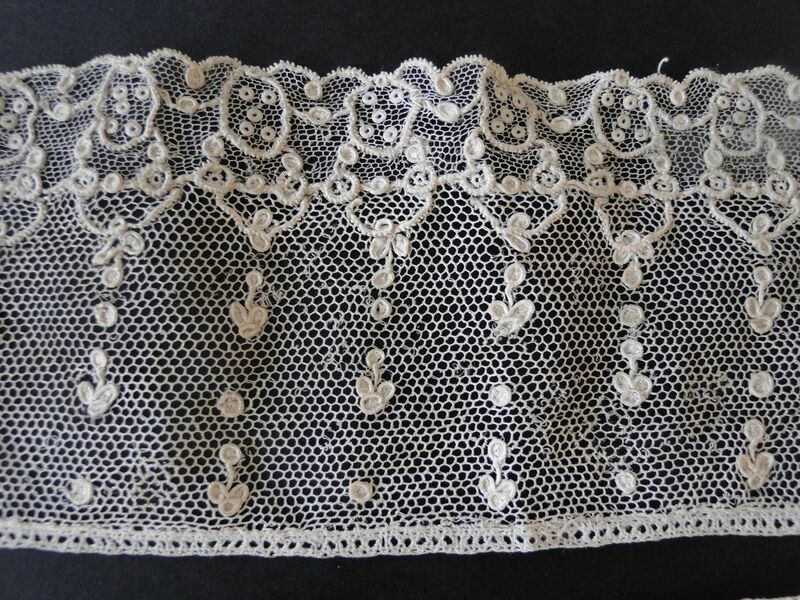 I’ve heard the name Valenciennes Anglaise associated with this kind of lace, but haven’t tracked it down in detail. Tends to be very finely done, and this is no exception. Modifications: Cut one end, cut and I think secured on the other end. Damage: Seller cites occasional small break to top edge. Soilage: Area of slight age discoloration. Sold for 14.00 GBP, 1 bidder. 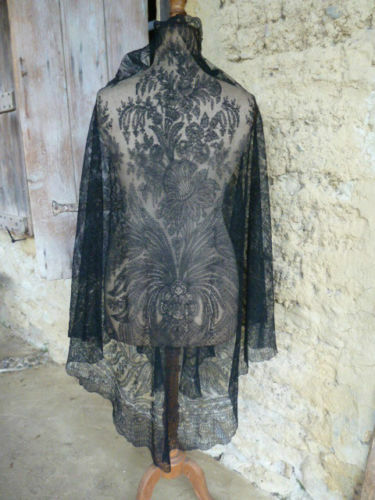 Comments: A black triangular bobbin tape lace shawl. Could be Russian, but I think it has a more Eastern European flavor. The tapes are thin and meandering, looks like it would adapt well to figural work. Square mesh ground with a few woven leaves. Damage: Seller says there is some repair. Unsold as of 4/6/2015 1:22 PM MST. Comments: A Honiton collar which could also be used as a dress front. Snails/slugs style with mirror symmetric design, although a bit crowded. There appears to be a rather coarse thread making the mesh with some thread would around intersections. Good woven tally leadwork fillings. 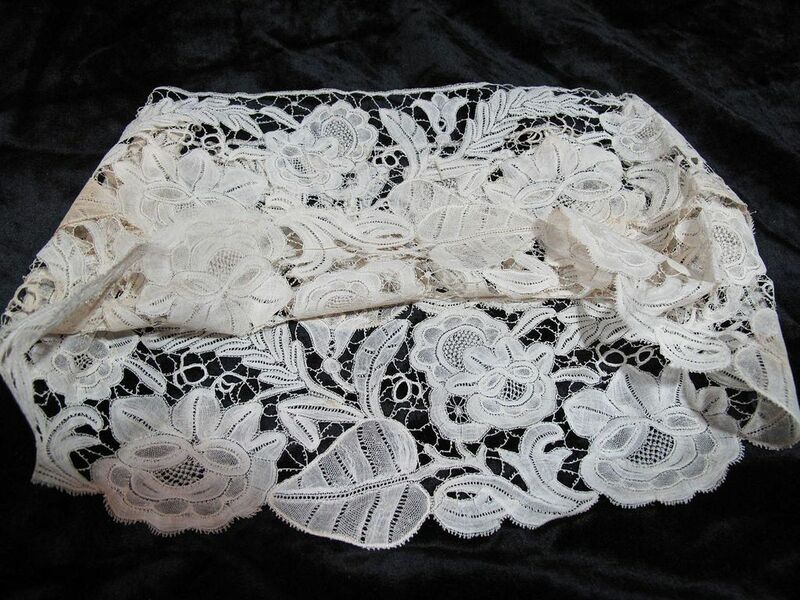 Comments: Looks like Point de Paris bobbinlace around the border of this table cover – the kind you sometimes see in pottenkant laces. The design fits around the corners, and you can see the join in the lower left. Good solid figural work with a bird, probably a peacock. Excellent embroidery and drawnwork in the linen. Sold for $116.50, 3 bidders. Comments: A Brussels Duchesse handkerchief. No raised work in the Point de Gaze inserts, and only simple needle-made knot grid fillings. 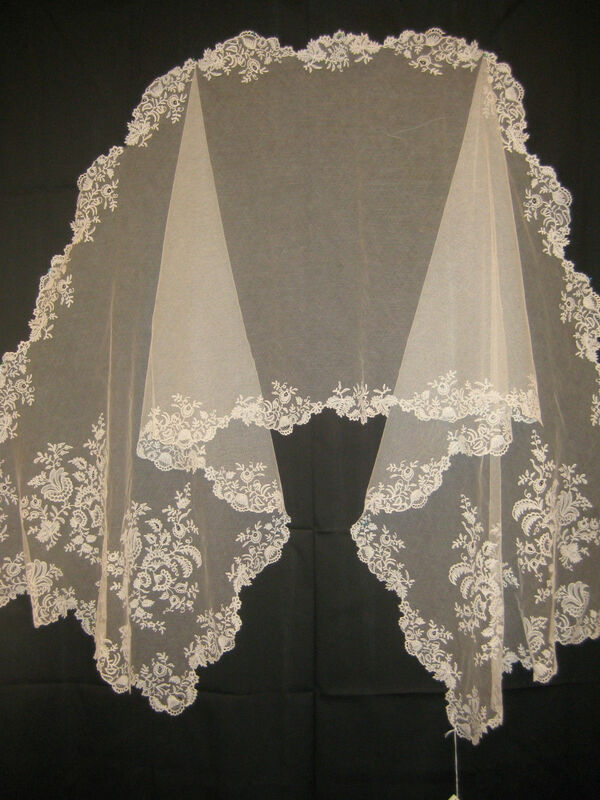 The Duchesse motifs are small and well-worked with a few bride fillings. No raised work in the bobbinlace that I can see. Nicely sculpted inner border. Modifications: None. I wonder if the center was replaced at some point since it is so white. But probably some time ago. Soilage: Lace and center are ‘subtle ecru color’. Sold for $61.00, 5 bidders. 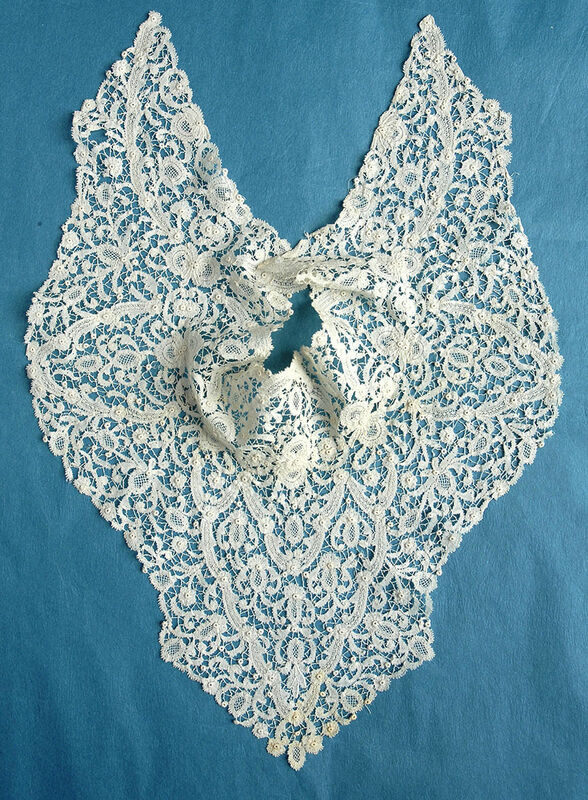 Comments: A Brussels Duchesse collar or dress front. Raised petals in the Point de Gaze roses. No needle-made decorative ‘mode’ fillings other than the standard rayed affair found in most PdG roses. A little raised work in the bobbinlace on halfstitch background. The shape of the piece is a bit unusual, rather small and I’m not entirely sure how it is used. Modifications: None. Three small hooks attached. Finish: Light fold crease down the center. Sold for $25.00, 1 bidder. Size: 3.5″ x 50″ joined together to form 7″ x 25″ circle. Comments: Hmmm. I think the two pieces are intact and could be separated. This looks a little like Valenciennes de Gand, but with picoted brides instead of the square mesh. Innovative floral and leaf design, excellent technique. Modifications: Two lengths sewn together lengthwise, then in a circle. Finish: I think I see some fold creases. 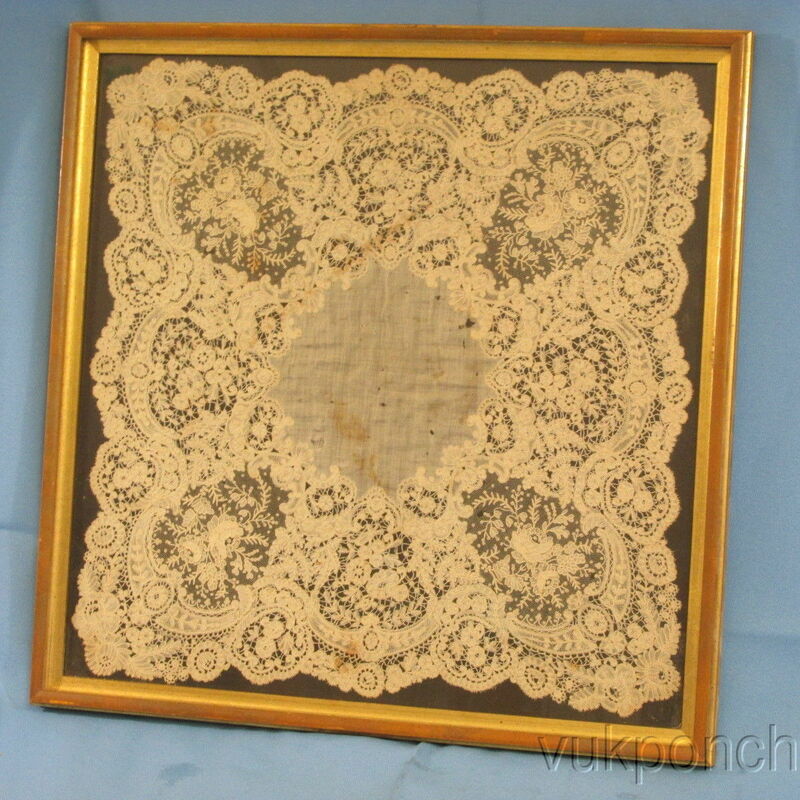 Comments: A rectangular shawl of Brussels bobbinlace applique on machine net. 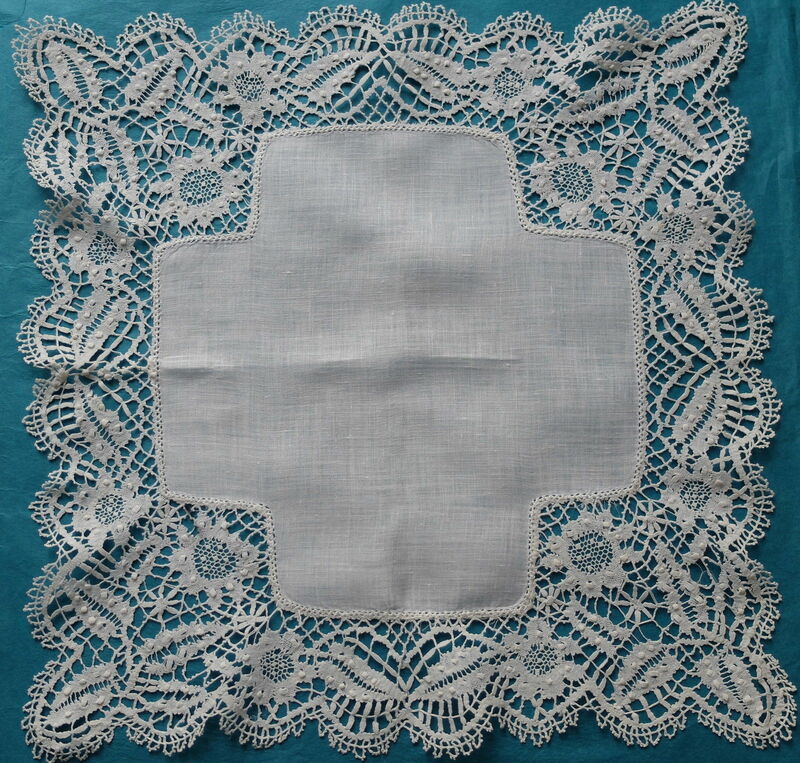 The motifs are not typical Honiton, and the fillings appear to be needle-made which is a sign of a Belgian product. Good floral design, small well done motifs. No esprits in the main ground. Most of the design is massed at the ends. Soilage: Looks clean – maybe a little beige in color. Finish: No obvious folds or creases. Unsold as of 4/6/2015 1:24 PM MST. Comments: This insertion looks like Cyprus work, without a cut/drawn cloth ground which puts it more in the Punto in Aria camp. I’ve never seen the figural work before. Interesting piece. Provenance: Purchased in the early 1900’s, belonged to the Widener estate (rumored). Modifications: Can’t see the ends to tell if they are cut. Removed from a bedspread. Damage: A little worn along top edge. Occasional loose thread. 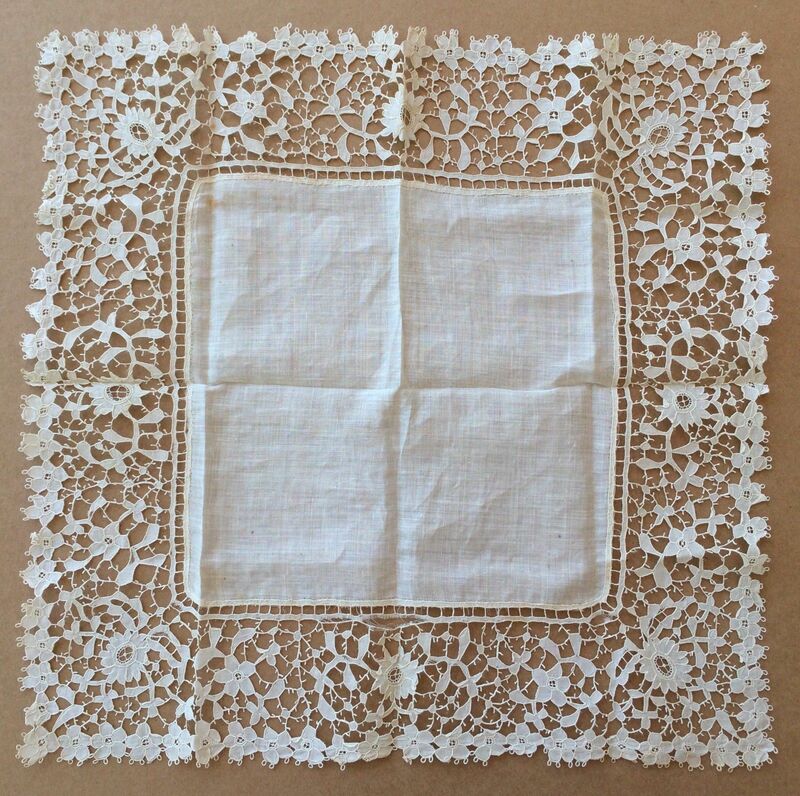 Comments: A handkerchief of Point d’Angleterre – bobbin motifs with a Point de Gaze ground. There is a more conventional Point de Gaze insert in the centers and in each corner – no raised petals in the roses. 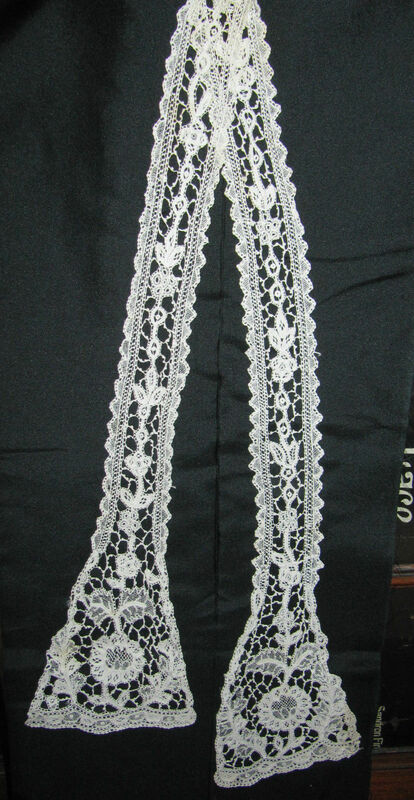 Not much raised work in the bobbinlace either, motifs are small and delicately done. 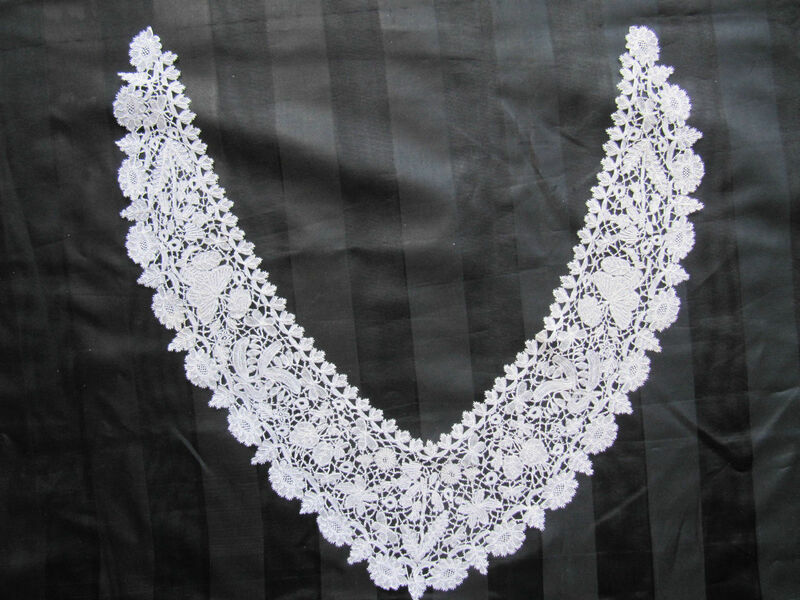 Typical of this lace. Beautiful attachment to the center cloth. Damage: A few pinholes in the mesh. Comments: A dress front and choker collar of Rosaline Perlé – looks all one piece. The perls look needle-made. A few perls are used in the mesh and at the tips of some motifs. Some interesting fillings in the carefully done bobbin motifs. 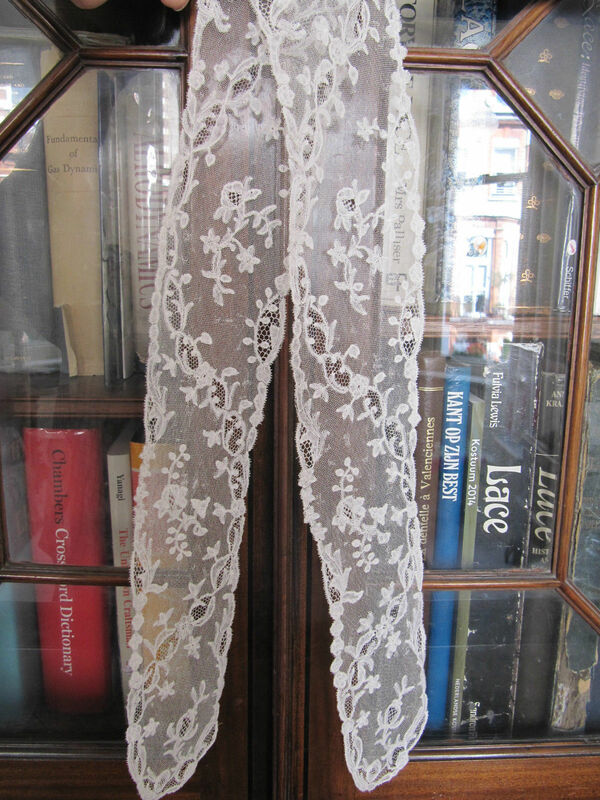 Interesting and elaborate piece of one of the best later 19th century Belgian laces. Sold for 76.50 GBP, 4 bidders. 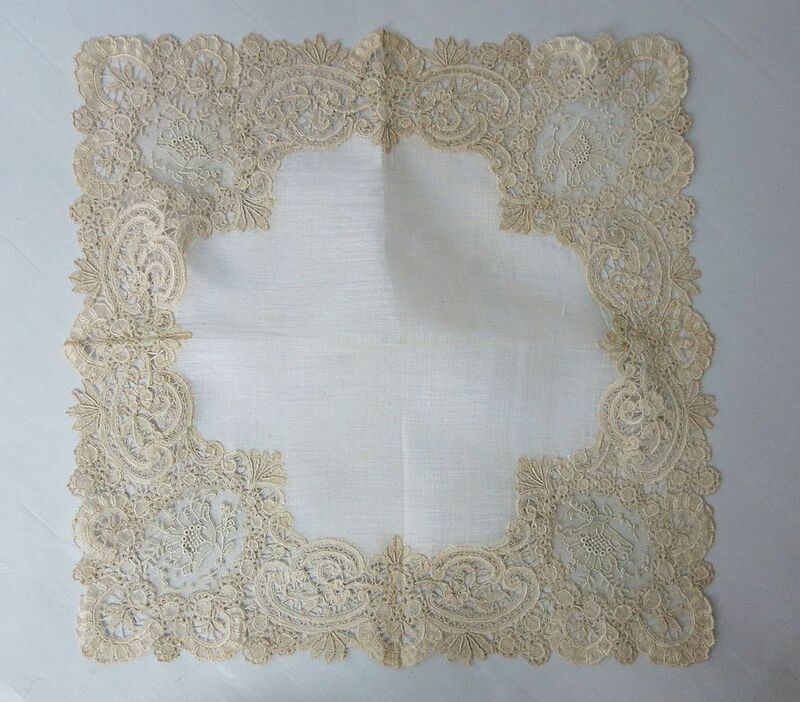 Comments: A Brussels Duchesse handkerchief, framed. Raised petal roses in the Pont de Gaze inserts. Raised work on halfstitch ground in the bobbinlace. Quite an elaborate design, well executed. A higher end market piece. Damage: Small holes in the cloth, some pinholes and small holes in the Point de Gaze mesh. Soilage: Rust stains on lace and cloth. Don’t know what the backing is in the fram, but I recommend it be removed. Finish: A little wrinkling in the cloth. 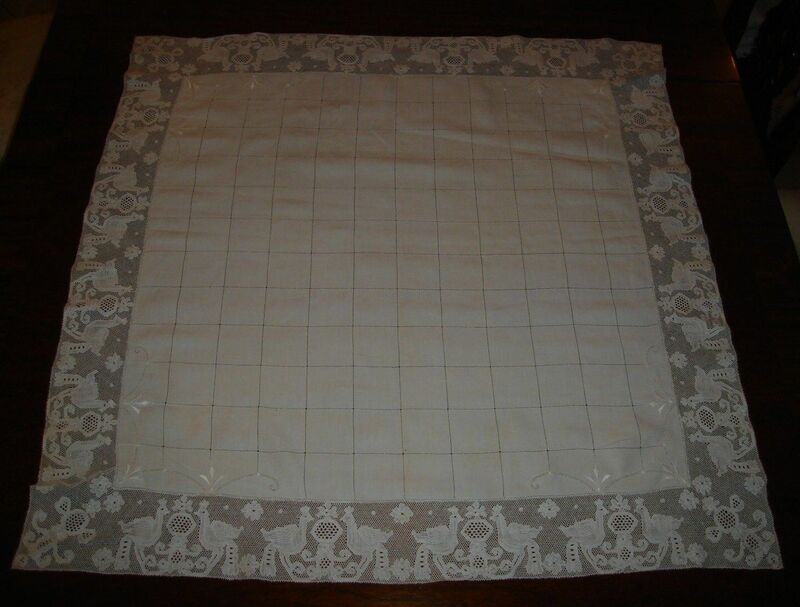 Comments: I have a handkerchief of this exact pattern in my collection, and I’ve seen others. It’s typical of late 19th early 20th C Armstrong work. Well done work with raised tallies in the leaves and roses. Good design, ideal for a Beds collection. Damage: Cut cloth edges a little frayed. Finish: Looks a little stiff and very white – might have been starched? Sold for 19.00 GBP, 2 bidders. Comments: A Carrickmacross guipure handkerchief. Damage: A little fraying along some cut edges. One separation in the band next to the cloth. Typical looped picots around the edges, and note the straight picots on the brides. Some needlemade fillings in flower centers. Good crisp design. Finish: Horizontal and vertical fold creases, also some wrinkling in the cloth. Size: Not given, but tape measure gives 17″ across laid flat. 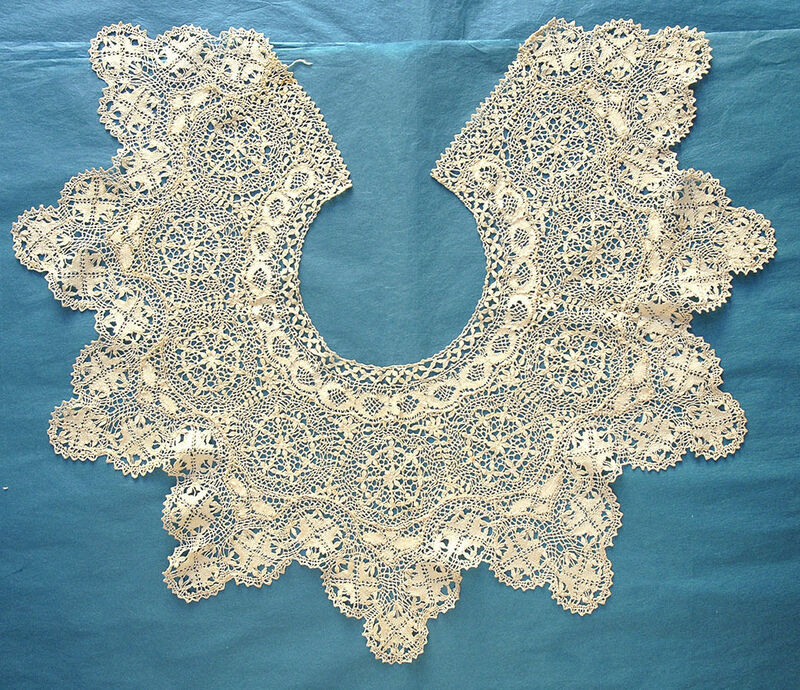 Comments: A Honiton collar with figural work of butterflies. Interesting raised work on some of the leaves and the larger butterflies. Involved design, well out of the snails/slugs mode. It uses the Honiton floral denseness to good effect. Note the alternating use of whole and half stitch in the insect wings and flower petals. Plaited, picoted brides, roughly square mesh. Sold for $265.00, 6 bidders. 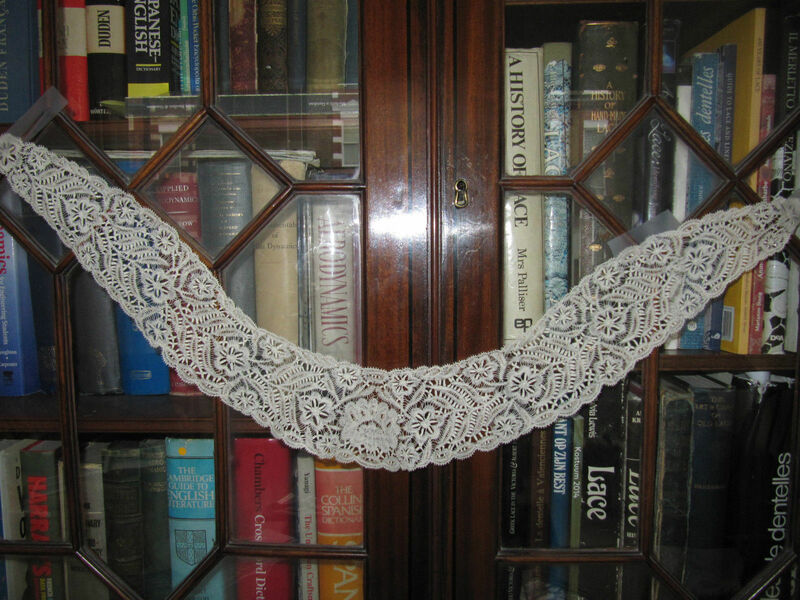 Comments: A narrow tie of Youghal needlelace. 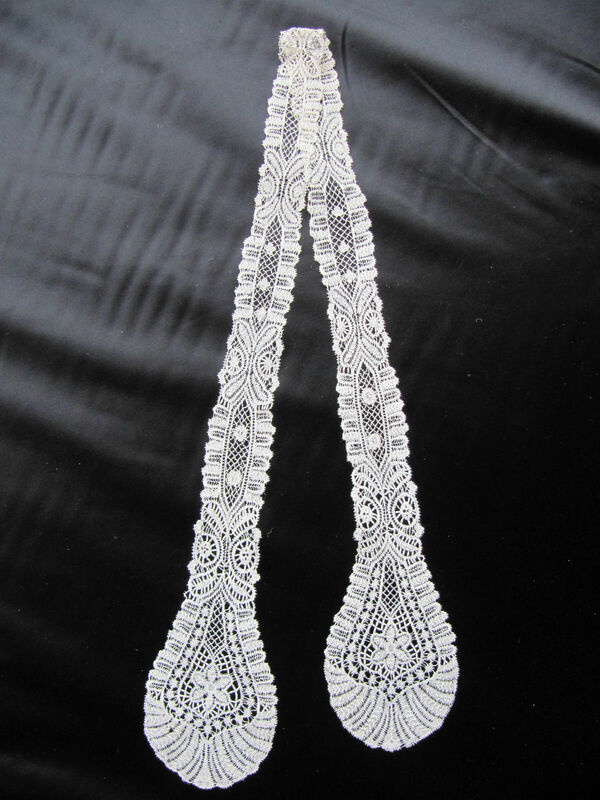 Not a very ambitious design, but typical technique for this lace. Finish: Might be a crease in the center. Sold for $110.00, 3 bidders. Comments: A lappet scarf of Beds. The design resembles the manufacture of Thomas Lester. Note the elaborate raised tallies against the clothwork. It uses a little gimp, but not much. Interesting design, excellent technique. Modifications: None. Tag sewn in near the center. Sold for $150.00, 4 bidders. Size: Not given, but a tape shows ~25″ across when laid flat. Comments: A long collar of Beds, again resembling Thomas Lester work. All the woven tally work along with the little threads connecting the motifs gives this an interesting, light appearance. There appears to be a gold colored thread worked into some of the motifs, almost like a gimp or outer thread. Very unusual. $72.00, 4 bidders, reserve not met. 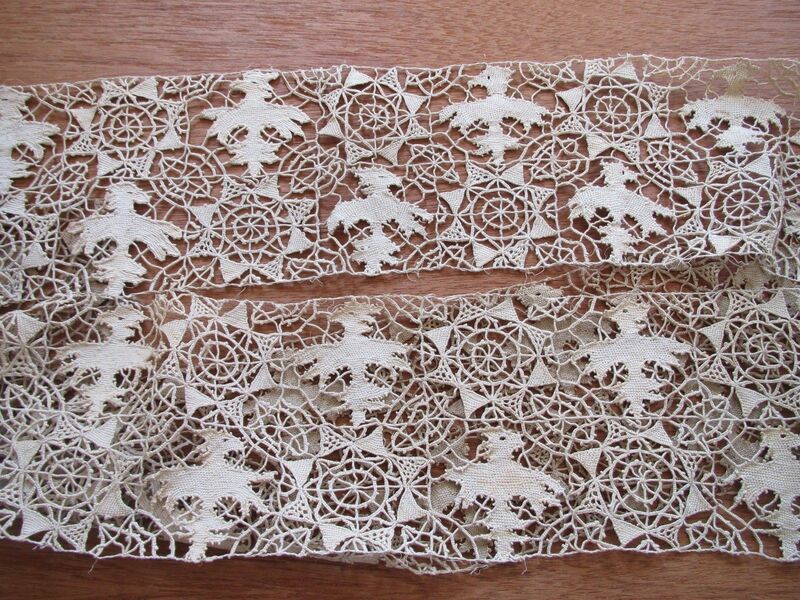 Comments: A simple joined lappet set of 3rd quarter 18th c Brussels bobbinlace with droschel ground. Typical band structure to the design, rounded ends. Modifications: Cut and joined in the center. 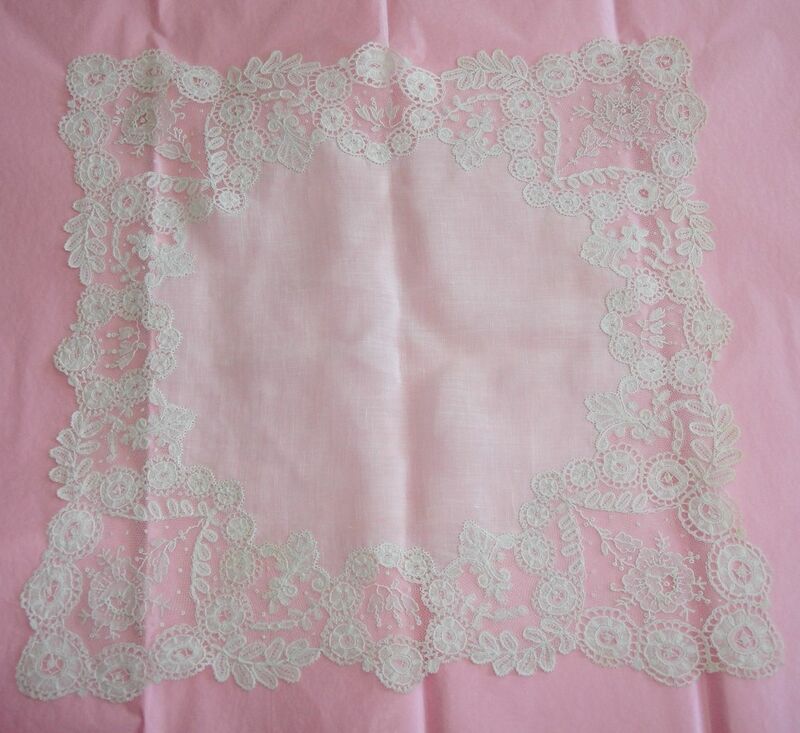 43″ is a little short for a lappet set like this. Damage: Some repairs and a few pulls in the ground. A few breaks in the fillings.